I'm back from London, and all ready to catch you guys up on my baking adventures for National Cupcake Week. 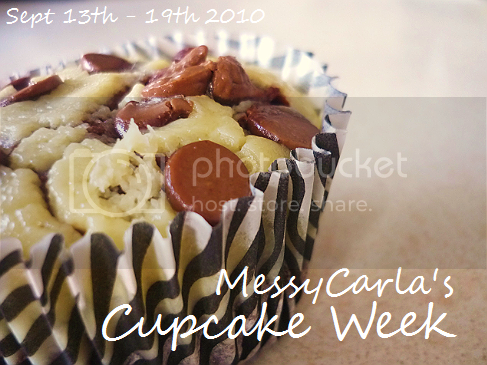 This is going to be part one of two posts today, so tomorrow I'll be able to write up my final cupcake recipe, and the grande finale for this series! 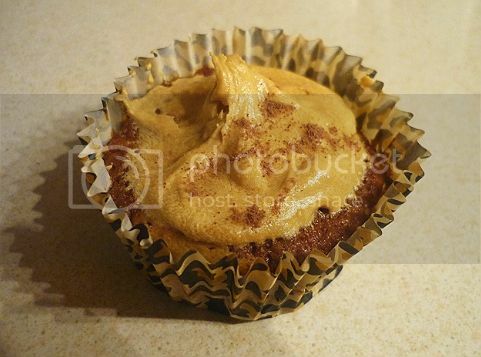 So cupcake recipe number 4 is Sticky Toffee Cupcakes with Salted Cream Caramel. 1. Preheat the oven to 180ºC/fan170ºC/gas 4. 2. Place the paper cases into a 12 hole cupcake tin. 3. In a heatproof bowl, pour 180ml boiling water over the dates and leave to soak for 20 minutes. with a fork, gently break up the dates and stir in the vanilla. 4. Sift the flour and bicarbonate of soda into a bowl and set aside. Cream together the butter and sugar for a good 5 minutes until very light and fluffy. Add the eggs gradually, beating between each addition, slipping in 1 tbsp flour about halfway through to prevent curdling. Lastly, fold in the remaining flour and then the date mixture. 5. 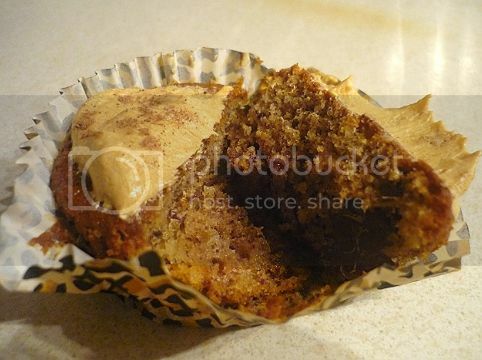 Spoon into the cupcake cases and bake for 15–20 minutes (the tops should spring back when pressed with a finger). Remove and leave to cool. 6. For the caramel: Dissolve the sugar and 60ml water in a small, solid-based pan over a gentle heat, then increase the heat to a boil. Wait a few minutes, leaving the pan undisturbed but watching it like a hawk and, as soon as it changes to a wonderful caramel colour (like strong tea) and is thicker, remove immediately from the heat, stand well back, and add the cream. 7. Be very careful as it is searing hot and it may splatter a little. It will react, or ‘seize’, and you may think it has gone wrong; it hasn’t. Keep stirring, adding the salt and the vanilla. Leave until stone cold. 8. For the buttercream Cream the butter and icing sugar for at least 5 minutes with an electric mixer and add the caramel. 9. Put the buttercream into the piping bag fitted with the star nozzle and pipe it on to the cakes, or spread it on with a palette knife. This was my first attempting at a few things - fruit-based cupcakes and caramel, and they both came out rather wonderfully. If you want to save time and eliminate the caramel making section you can use shop-bought, and just add it to the buttercream, but for me there's nothing quite like home-made caramel! I think I overcooked it slightly, but I quite liked the bittersweet flavour when mixed with the icing sugar. I was expecting the sponge to go quite stodgy like a pudding, but it was light as a feather and incredibly moist from the soaked dates. I DEFINITELY recommend this one, as they're a modern twist on a British pub grub classic. Stay tuned, as I'll be posting the second recipe later on today - you'll be pleased to know, it's full of peanut buttery goodness! YUM! My favourites so far. Loved all of the recipes but this sounds amazing.